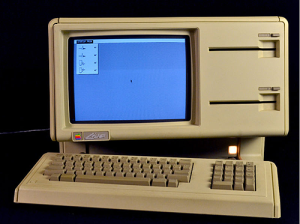 Since we live in the era of the Mac and the iPhone, we tend to overlook the earliest, non-Mac era of Apple history—a time when lumbering digital beasts roamed the earth. As a result, many misconceptions about Apple's earliest products continue to spread throughout the Internet unchecked. It's time to rectify that with an authoritative field guide to these early creatures. At the height of Apple Computer’s classical age, these binary dinosaurs came with names like Apple I, II, and III—Roman-numeraled computer systems with lineages almost as ancient as the numerals themselves. Thanks to recent fossil discoveries in the Masonite-Gypsum Shale Deposit (also known as my garage), we can now paint a fairly complete scientific portrait of these early Apple-bred creatures, including information on their habitats, diets, and behavior. Although every one of the following species is now extinct, it’s worth taking a moment to reflect on how far today's Apple species have evolved from their earliest forms. Trivia: This short-lived specimen, the earliest known ancestor of all Apple dinosaurs, only appeared briefly in the fossil record. Its primitive form often lacked the protective shell that scientists believe later developed to defend its internal parts from torrential Mountain Dew spills. Lacking such a protective enclosure, the semi-aquatic Apple I often floated in a primordial soup of hobbyist goodwill that nourished the machine through osmosis. This founding model of the Apple II species, with its streamlined body, seems well adapted to freshwater aquatic environments, and yet its rubber feet made it firmly at home on a household desktop. Digital food was scarce during its amphibious reign, so the Apple II relied on manual data entry through its keyboard or preformatted nutriment streamed through its cassette interface. Life was apparently difficult for this early member of the Apple family, as numerous specimens have been found filled with card-like parasitic organisms. Trivia: In the fossil record, Apple II Plus specimens often appear next to a symbiotic organism known as the Disk II. Based on studies of the Disk II’s anatomy, this smaller organism apparently fed the II Plus a steady diet of diskette-based data in exchange for protection from predators. When partnered with the Disk II, the Apple II Plus could more easily digest VisiCalc spreadsheets, which aided its adaptation to businesslike environments. Trivia: Little is known about the rare and massive Apple III, but scientists speculate that it could operate in extreme heat environments without ill effect due to its unique metal heat sink base. This ingenious adaptation to hot environments may have been responsible for its extinction as the climate cooled in the mid-1980s. Alternate theories suggest that extensive interbreeding with the Apple IIe, which likely shared a common ancestor with the III, may have led to the Apple III’s complete disappearance from the fossil record. The Apple IIe lived during a time of great upheaval in the digital climate. With its relatively light weight and low motherboard complexity, the IIe found a welcome ecological niche in educational environments, often as the plaything of juvenile Homo sapiens. Later forms of this svelte but hardy beast, which commonly lived along the Oregon Trail, survived the mass 8-bit extinction of 1984 that killed over 90 percent of the 8-bit digital dinosaurs. Those advanced forms include the IIe Enhanced (1985) and the IIe Platinum (1987), both of which emerged after the dawn of the Macintosh. Trivia: Our understanding of the Apple III+ is limited, and is mostly based a handful of lower chassis segments discovered in a Michigan corporate sewer in 1997. Based on extensive reconstructions, most scientists believe that the III+ was covered with a colorful coat of feathers that allowed primitive powered flight from office windows. However, its heavy frame would have prevented a gentle landing, thus explaining the many fractured and incomplete pieces of this machine found in the fossil record. Paleontologists first discovered fossils of the Lisa, the largest of all early Apple dinosaurs, encased in concrete at a landfill in Logan, Utah. That initially led many scientists to believe that the Lisa dwelled in subterranean habitats. However, the recent discovery of a previously unknown tail-like appendage, which contains a freely rotating ball, has convinced experts that the Lisa may be a direct ancestor of the first Macintosh species. Accordingly, the Lisa is often known as the “extremely fat Mac” due to its size and lumbering form. Its ample weight and girth likely arose as an adaptation to large quantities of free-flowing oxygen/capital in the atmosphere before the Dawning of the Great Responsibility that struck Apple headquarters in mid-1985. After that time, much smaller Apple computers like the Macintosh and the Apple IIc appeared on the scene and completely changed the computing landscape, although how they developed, exactly, is still a mystery.